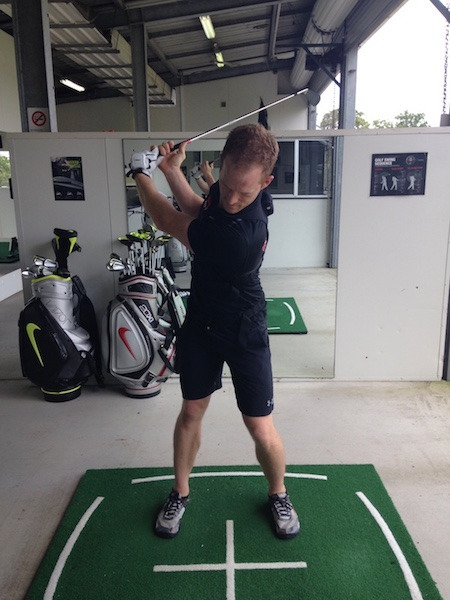 This article was co-authored with Chris Gibson, an Australian AAA-rated golf professional. His teaching philosophy focuses on simplicity and longevity in the game, providing help for golfers at all levels. He focuses on interpreting information from technology and applying it in the simplest way possible to help his students. Rotation is a buzz word that gets used a lot when talking about the golf swing. And it should. Golf is a rotary sport that requires us to turn the body in order to generate power in the action of hitting the ball. More often than not, rotation is discussed with reference to quantity: How far? How much? How many degrees? In our opinion, body rotation in the golf swing (like so many things in life) should be discussed in terms of quality, not quantity. Why is it important to change our attitude toward rotation? Because talking about it in terms of quantity, while claiming that more is better, does not help the majority of golfers. A reverse spine angle/over extension of spine, with a head that moves toward target (Photo 1). A collapsed lower body (Photo 2). It would benefit a huge amount of golfers around the world to get a better understanding of what quality rotation is and where it needs to happen. Quality rotation is the act of a joint moving through a range of motion in a way that is efficient, controlled and repeatable. Essentially, the correct muscles are exerting the correct forces on the correct bones in order for them twist against one other in the correct way. This allows golfers to get into powerful positions in the backswing, which in turn allows us to rotate in the opposite direction and return the club back to the ball in the most efficient way possible. 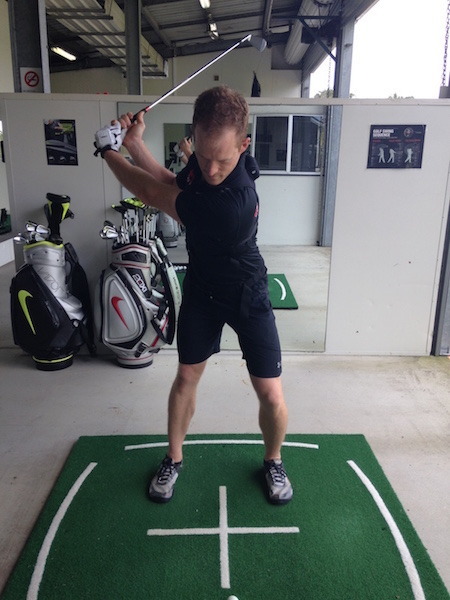 The three areas that we need to generate quality rotation from are the hips, shoulders and thoracic spine. It’s not mere coincidence that these are three of the most mobile areas in our body and are specifically designed to achieve large ranges of motion. 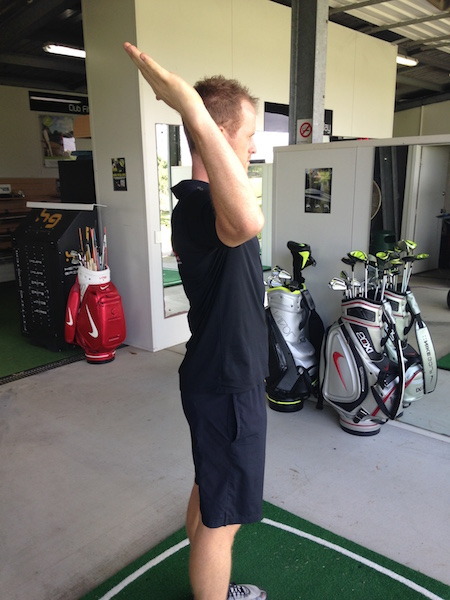 At the hip, we are looking for efficient internal and external rotation (see Photo 3). That is the pelvis turning around the top of the thigh bone (femur) efficiently, without the all-too-common compensations (see Photo 2). From the thoracic spine, we need the vertebrae to turn, one on top of the other (see Photo 4 of thoracic rotation). This allows the sternum (breastplate) to face away from the target, creating a wind-up effect in the torso without the usual compensations (see Photo 1). Here, we would like the shoulder externally rotate, essentially turning the inside of the elbow outwards (see Photo 5). 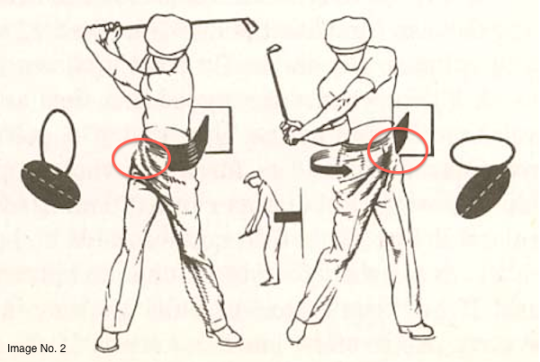 This allows the club to be set “on plane” without the common shoulder-level compensations (see Photo 6, flattened shoulder plane). If golfers can find quality rotation in each key area, then they have a good chance to find a solid backswing position from which they can reverse the movement back to the golf ball. Different people have varying capabilities to rotate in the three key areas. Sandy Lyle, Jason Day and John Daly have completely different amounts of rotation in their bodies during the golf swing. They are all long hitters who generate huge amounts of power from varying QUANTITIES of QUALITY rotation. If you have limited range of motion in one or more of the three key areas, don’t despair. 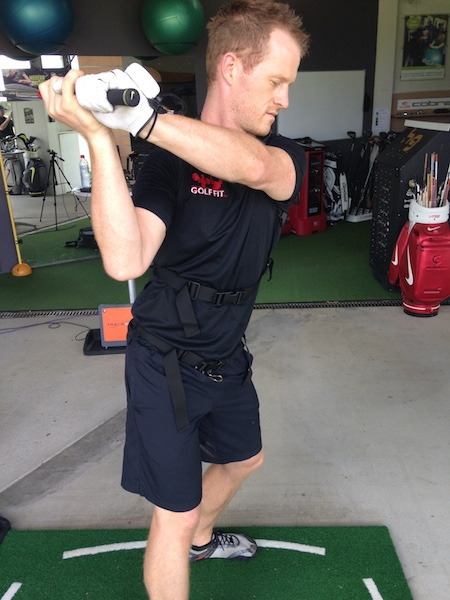 Make the most of what you have, and you can still be efficient and powerful in your golf swing. 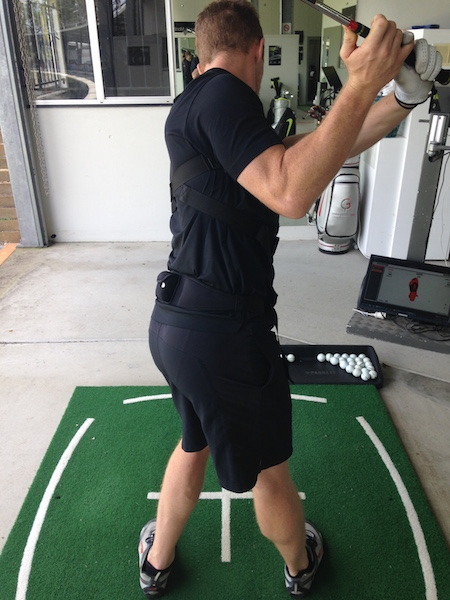 Technology does a great job of quantifying our body and club movements during the swing. 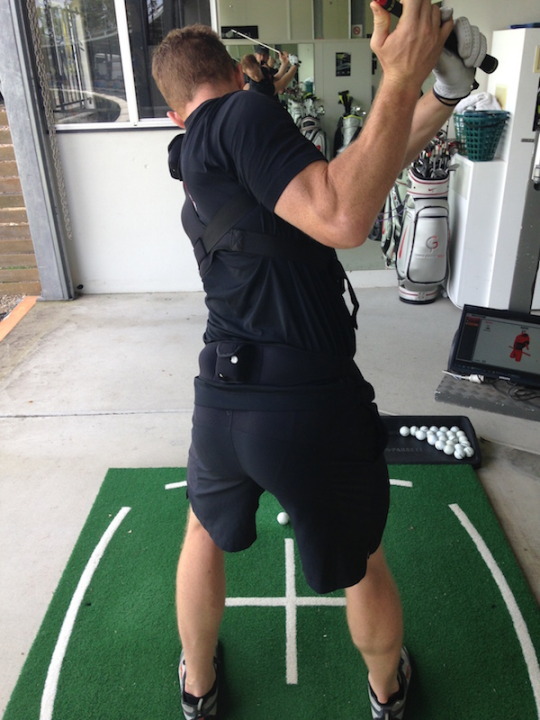 The most popular and accessible form of movement analysis comes in the form of K-Vest. K-Vest essentially tells us the degrees of rotation that we are achieving at the pelvis (hips) and at the thorax (chest), as well as how far our pelvis tilts from front to back. 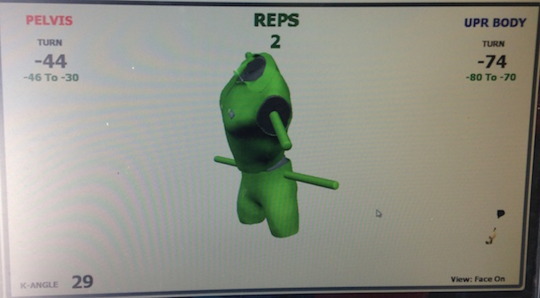 While K-Vest gives recommendations for quantity of rotation, it’s up to the user to interpret the info, match it up to the way the body is moving and look for the quality of rotation. Here’s an example (Photo 7). 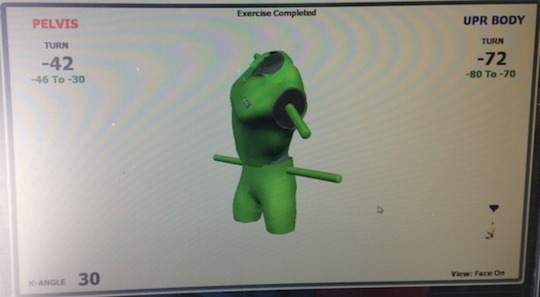 Nick is achieving the K-Vest recommended degrees of rotation at the pelvis and at the thorax, which is demonstrated in Photo 8 (green is good). The position looks pretty solid. There’s a nice dynamic rotation in the key areas. In Photo 9, Nick is also achieving the K-Vest recommended degree of rotation at the pelvis and thorax, but you’ll notice that the position does not look very efficient. That’s why just looking at the numbers (Photo 10) can be detrimental to a golfer’s swing. We have to focus on the quality of rotation, because simply going after the quantity can be very misleading. As golf coaches and golf fitness professionals, we need to learn to recognize what good rotation is and how to assess and measure it. 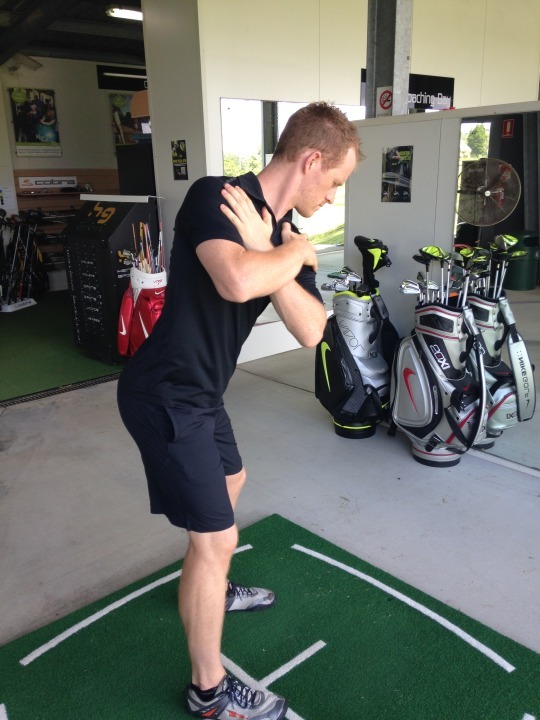 As for golfers, we need to learn what quality rotation looks and feels like, then go about practicing and training it. Let’s shift our context of rotation from “How much?” to “How well?” so we can play more golf, and better golf, too!